Check out this two bedroom, two bathroom condo at Inlet Reef that sleeps 8 total guests, room 213. The Guest Bedroom has two Full size beds and a wall mounted flat screen Smart TV. The Guest Bathroom has a bathtub/shower combination. The Master Bedroom has a King size bed, a flat screen Smart TV, and balcony access. The Master Bathroom comes complete with its own separated makeup area, two vanities, and a combination bathtub/shower. 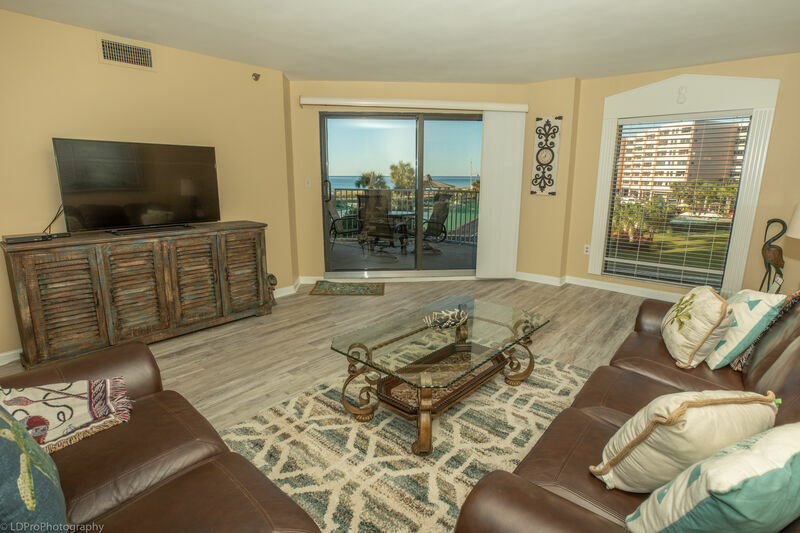 The hexagonal balcony boasts plenty of outside seating and an amazing view of The Gulf of Mexico, Destin’s Beach, and Inlet Reef’s pool area. This was a wonderful place to spend our spring break! This condo is stunning. The pictures do not do it justice. This was our first trip to Destin and when we return we will definitely rebook this unit. Comfortable beds. Updated and well equipped kitchen. Great view from balcony. Washer/dryer a huge plus. Hands down for a family of 8 this IS one of the best property we've vacationed at. You will not be disappointed ! Location is close to local shops . The beach access is to die for and all the staff are friendly and helpful. Defiantly a home away from home.